Excellent battery. Last one lasted 2 years on my boat despite my lack of care. Fabulously fast delivery to me in rural France. Exact replacement for my last Enduroline EXV90 bought from Tayna in 2012 - it's the only domestic battery on my 29' sailing boat and I hope the new one also lasts for 6 years! Great service and next day delivery from Tayna. Good product and excellent delivery. Thankyou. Straight forward purchase, and trouble free purchase. Extremely good service as usual. Well packed and delivery made on time. 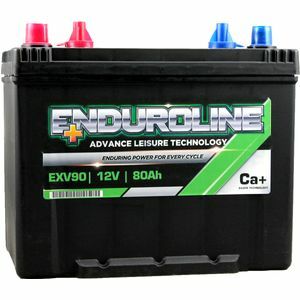 The ENDUROLINE EXV90 gives excellent service with a good extended guarantee. A very cost effective battery. What more could a chap want! Speedy delvery. Competitively priced replacement for old leisure battery. Performs as expected. Just the job. Thanks for very quick service & help with my questions.Battery fitted ready to rock n roll. Highly recomend Tayna. Great battery at an excellent price. We use them for long duration research project instrumentation testing and they have proved most economical and reliable. Battery arrived next day as stated. Very well packaged. Put straight to use on electric gates. Web site very easy to use. Would use site again. This well priced battery is used as a second 'domestic' and back-up 'engine starting' battery on a small boat. It's perfect for the job.